Startup and small businesses are finding it a challenge to create and manage effective marketing campaigns when they have little to no budget, but corporations spend $17billion on sponsorships each year which could make all the difference in how businesses brand themselves and get their names out there. Lillie Mae founder of Lillie Mae PR agency has worked with several national brands and business owners for more than 10 years and not only has she been successful in generating high profile media exposure for her clients a la USA Today, Black Enterprise, Billboard.com and The Hollywood Reporter to name a few, but she has also raised sponsorship dollars for them and for her business as well. 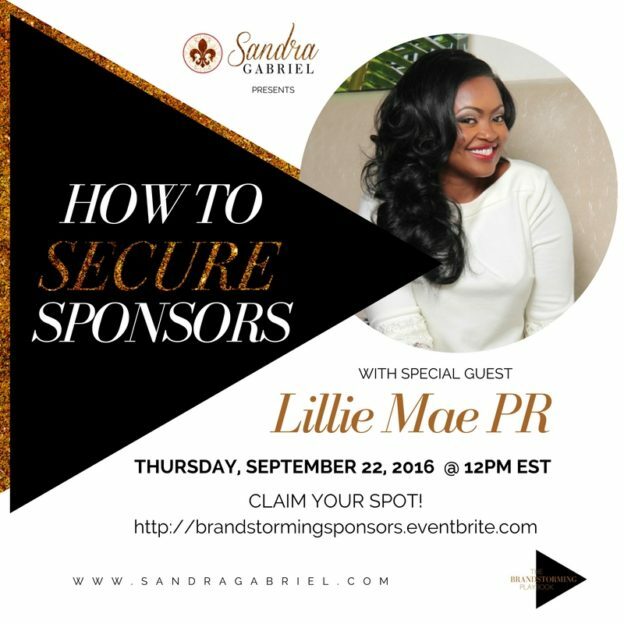 Lillie Mae and I will get into a brandstorm on sponsorships on Thursday, September 22, 2016 at 12pm EST and we’re inviting 50 people to join us to capture all the juicy insight and ask their own burning questions about targeting and acquiring sponsors. It’s free to attend, but space is limited so CLAIM YOUR SPOT NOW!